Being a Superhero Parent means that your family time is always be Extra Super Special – right? We couldn’t agree more, so what could be more heroic than a thrilling day at a theme park? Power up your jet-powered funpacks, Super Parents, and dig out your favorite cape. Here’s our list ideas for amazing things to do in Arlington, TX. Your next thrill-ride visit to Arlington’s gonna be legendary. Normally, we’d say that heroes need their veggies. But your crisper will hold your salad fixins until tomorrow. Let your tastebuds run wild as unique flavors and treats await. You gotta try a Pink Things at Six Flags Over Texas. Afterwards, how about a bag of Pickle Popcorn from The Popcorn Store in Lincoln Square; ooey-gooey chocolate fondue at The Melting Pot; the original Irish Nacho at J. Gilligan’s; or a Flamin’ Hot Cheetos Dog at Globe Life Park (no, we’re not kidding!). 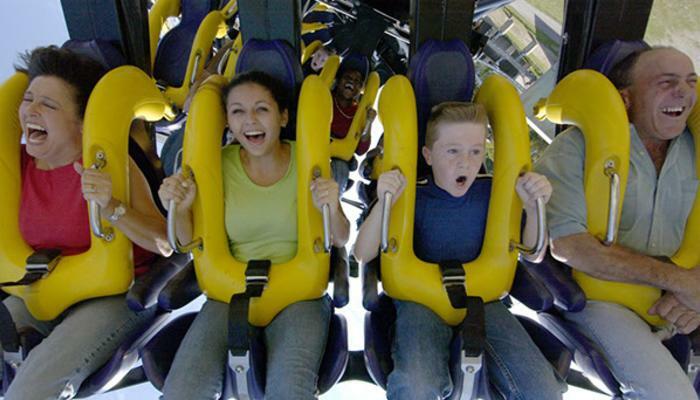 Any Super Parent headed to Six Flags should know about Thrill Swap, which allows you to keep your group together even when a child can’t or doesn’t want to ride a particular ride. Here’s how it works: When preparing to board the ride, notify the attendant that you&apos;d like to use Thrill Swap. One adult rides while another stays with the child. When they return, the swap takes place; allowing the other adult to ride as the child waits with the other guardian. It’s that easy! Find out more. Bugs Bunny Boomtown is a perfect stop for families with little kids – as well as families with grownups that need a rest in the shade. Older kids will enjoy Gotham city for a spin on the JUSTIC LEAGUE: Battle for Metropolis 4D and the all new villain rides! Check into the hot concerts and events all summer long. When you need to refuel, mealtimes are easier to navigate if you hit Six Flags eateries on the early side or the late side of traditional lunch and dinner hours. And every Super Parent needs to know about the Flash Pass, which allows you to “check in” to ride lines but do your waiting while you enjoy other parts of the park. Get more Six Flags tips. Impress your kids with your rock star ways when you rent one of the park’s 20 semi-private shady cabana areas that are available each day. They come with all the amenities you need to do Hurricane Harbor in style, including a storage locker, full food service, lounge chairs, and fans. More about Hurricane Harbor Cabanas. Before your visit, call the Hurricane Harbor information hotline at 817.265.3356 to hear about current discounts and special events. Lockers are available near the main entrance, so bring a jacket or sweat shirt for cool mornings and evenings. Get more Hurricane Harbor tips. My name is Jason Torres and I'm a born and bred New Yorker from the Bronx. Moving to Texas was not an easy move but as is evident by the ring on my finger, I find Texas has some pretty ladies! On many weekends I rock shows as a Christian rap artist performing for local ministries and events from my original studio albums. As of 2014, I began the wonderful journey of being a father to a beautiful little girl named Melody Rose so entering into parenthood I've realized that my wild adventure in life has only just begun... Stay tuned.